This kit is an inverse PCR (iPCR)-based site-directed mutagenesis kit using KOD DNA polymerase (1)( 2) as a high-fidelity PCR enzyme. This reagent was developed based on a high efficient and efficient PCR reagent, "KOD-Plus- (Code No. KOD-201)", which consists of KOD DNA polymerase and anti-KOD DNA polymerase antibodies(3) for Hot Start PCR. This kit enables not only the introduction of point mutations, but also the introduction of large insertions and deletions. The PCR fidelity of KOD-Plus- is greater than Taq DNA polymerase (ca. 80-fold); therefore, unexpected, 2nd-site mutations can be reduced. PCR reactions can be performed using standard PCR primers and do not require phosphorylated primers, because this protocol contains a 'Phosphorylation Step' of PCR products. Applicable for various mutations, such as substitutions, insertions, and deletion mutations. High efficiency (95% maximum) can be obtained. Simple protocol facilitates speedy experiments. Phosphorylated primers are not required. A) Inverse PCR of plasmid DNA, using a mutation primer. B) Plasmid DNA is digested by Dpn I. Note: Dpn I digests methylated DNA, such as plasmid DNA from typical E. coli cell lines (e.g. JM109 and DH5α). C) Self-ligation of PCR products is performed by a reaction with T4 polynucleotide kinase and ligase. D) Transformation of E. coli cell lines using self-ligated PCR products. A 90 bp DNA sequence was deleted from a plasmid carrying FLJ32066 gene (7.3 kb) using KOD -Plus- Mutagenesis Kit [Code No. SMK-101] and compared with a kit from an alternative company (company A). In parallel, 18 bp-DNA cording a 6×His-tag sequence was inserted into the plasmid. As shown in Tables 1 and 2, the expected mutants were successfully obtained using the KOD -Plus- Mutagenesis Kit. 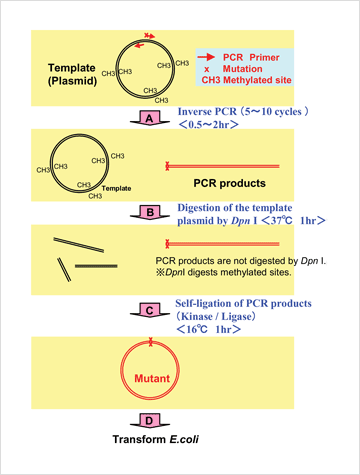 A 2,000 bp region in the plasmids from mutated clones was obtained from a control reaction (8 cycles) using Control plasmid (4.3 kb), Control primer #1, and Control primer #2 attached with KOD -Plus- Mutagenesis Kit [Code No. SMK-101] were sequenced. As shown in Table 1, the number of unexpected mutations was found to be approximately 1 base per 48,000 bases.